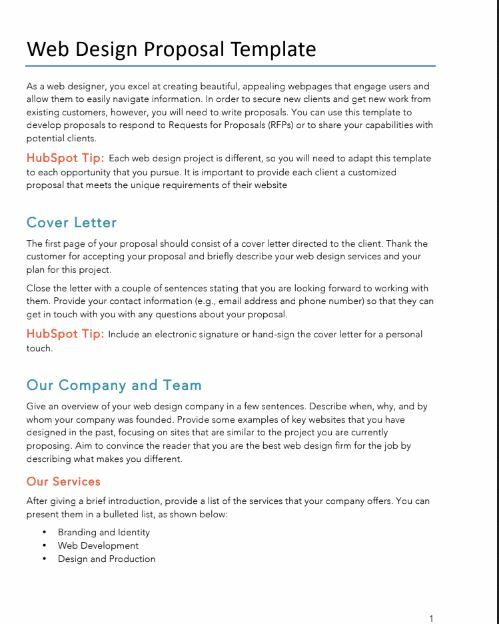 Describe how you'll improve your client's online presence or site with this customizable web design proposal template. Describe how you'll improve your client's online presence or site with this editable web design proposal template. Preview the text content for this template. ﻿Web Design Proposal Template As a web designer, you excel at creating beautiful, appealing webpages that engage users and allow them to easily navigate information. In order to secure new clients and get new work from existing customers, however, you will need to write proposals. You can use this template to develop proposals to respond to Requests for Proposals (RFPs) or to share your capabilities with potential clients. HubSpot Tip: Each web design project is different, so you will need to adapt this template to each opportunity that you pursue. It is important to provide each client a customized proposal that meets the unique requirements of their website Cover Letter The first page of your proposal should consist of a cover letter directed to the client. Thank the customer for accepting your proposal and briefly describe your web design services and your plan for this project. Close the letter with a couple of sentences stating that you are looking forward to working with them. Provide your contact information (e.g., email address and phone number) so that they can get in touch with you with any questions about your proposal. HubSpot Tip: Include an electronic signature or hand-sign the cover letter for a personal touch. Our Company and Team Give an overview of your web design company in a few sentences. Describe when, why, and by whom your company was founded. Provide some examples of key websites that you have designed in the past, focusing on sites that are similar to the project you are currently proposing. Aim to convince the reader that you are the best web design firm for the job by describing what makes you different. Our Services After giving a brief introduction, provide a list of the services that your company offers. You can present them in a bulleted list, as shown below: * Branding and Identity * Web Development * Design and Production Our Proposed Web Design Team Potential clients need to know that the redesign of their website is in good hands. Show them that you have assembled a professional team of designers and developers with specialized expertise and experience. Describe the role each member will play in managing the client’s website. Then, provide the name, title, and a brief profile or biography of each of your proposed staff. Include the team member’s years of experience in web design or development, any relevant certifications or skills, and similar projects they have completed in the past. * Team Member 1, Title – Profile * Team Member 2, Title – Profile * Team Member 3, Title – Profile HubSpot Tip: If you have professional headshots of your team, include them here to personalize your proposal and connect faces with names before the project even begins. Project Objectives Identify the problem that the client needs solved. Do they need a new website designed from scratch? Are they looking for a redesign of their current website? Talk about the customer’s goals for the project. Perhaps they are looking to increase traffic to their site, or to make the webpages accessible on mobile devices. Now describe your solution to the customer’s problem. Indicate how your design plan fits with the client’s strategic goals and tell them why it is important that they have a well-designed site. List the client’s specific requirements and describe how you intend to meet each of them. Consider presenting this information in a table format, like the one below. Requirement Our Solution HubSpot Tip: Before writing your proposal, gather information about the client’s objectives either by speaking with them directly or by reviewing background materials, like their existing website (if they have one) and the RFP (if one was issued). Major Activities and Timeline Indicate the activities involved in designing the website, with start and completion dates. You can use a simple table, like the one that follows, to depict the timeline. Activity Start Date Completion Date Information Gathering [Month], [Date], [Year] [Month], [Date], [Year] Design [Month], [Date], [Year] [Month], [Date], [Year] Development [Month], [Date], [Year] [Month], [Date], [Year] Launch [Month], [Date], [Year] [Month], [Date], [Year] HubSpot Tip: Including a detailed schedule highlights your credibility and shows your capacity to complete all phases of the web design project on time. Pricing and Payment Schedule Web design work often involves a series of flat fees paid according to a set schedule. You can use a table like the one below to indicate the proposed payment schedule. Amount Deadline Deposit – 20% of total Upon contract signing 25% of total Upon completion of Phase 1: Info Gathering 30% of total Upon completion of Phase 2: Design Final 25% of total Upon completion of Phase 3: Development and Launch HubSpot Tip: Update this section according to the specifics of the project. ________________ Signatures and Agreement Indicate what is needed to finalize the contract. Most likely, you will need a signature from the client, and payment of the deposit. Include a place for signatures by the client, like shown below. ________________________ [Name], [Role] ________________________ [Name], [Role] ________________________ [Name], [Role] HubSpot Tip: You should also add your company’s specific contract details indicating the terms and conditions for this work. Gallery Be sure to showcase your design skills in the proposal. Include a gallery of screenshots of websites you have designed in the past at the end of your proposal to give the client a sense of your style and abilities. HubSpot Tip: Consider providing links to websites you have designed so that the potential client can see real-life examples of your past work. Can I edit this template? Does a bear... Yes, you can edit this template. These are templates provided for your convenience and use. Nothing on this page creates an attorney client relationship and is not legal advice. If you want professional information, please consult your own attorney. Get the green light for your idea with this high-quality project proposal template. Win new clients with this impressive customizable consulting proposal template. Propose a new marketing campaign or contract with this marketing proposal template. Lay out what you're looking for with this bid proposal template. Sell your web design services with this professional website proposal template. Get backing for your project or organization's anticipated spend with this budget proposal template. Send price quotes to potential customers with this high-quality template. Give future clients a detailed view into the costs of a job with this estimate template.